Local Natives' Gorilla Manor could have easily scored points with the Hype Machine hive mind based on a handful of qualities the band shares with some of the more popular indie acts of recent years—the choral harmonies of Fleet Foxes, the carefully considered arrangements of Grizzly Bear, and intermittent bursts of Broken Social Scene bombast. However, the band rises above the dregs of pale imitators, thanks in part to a lively rhythm section spurred on by the serpentine playing of bassist Andy Hamm. Speaking to The A.V. Club from the band's home base in Los Angeles, Hamm discussed Local Natives' decision to self-fund Gorilla Manor, the reason he can't take credit for every bassline on the record, and why one song in the band's set at Antone's tonight, April 23, might sound a little familiar, though you won't know why. AVC: You recorded Gorilla Manor without the backing of a record label—was it scary taking on that kind of financial burden? AH: We didn’t really have any other option. We had these songs, and we knew we wanted to record them, and we weren't getting attention from a label at that point, or attention from a producer or anything. We were playing minimal shows and really hunkering down to make this album, and we knew we wanted to do it on our terms, as far as the writing and the sounds. And in order to do that, we knew that we had to do it ourselves. We started scrimping, saving here and there, everybody setting aside what they could. And then, luckily, [guitarist-vocalist] Ryan [Hahn]’s father came in—he’s been a huge supporter of the band—and he said, “We’ll set up a payment plan and I’ll front you guys some money so you can get it done on the cheap.” That came through, and we just went for it. AVC: What was the turning point where you started receiving more outside attention? AH: We’re still such a small band, so when we got offered to do a residency at a place like Silver Lake Lounge or Spaceland—things like that for us were a big attention-getter. We were playing to a lot of new ears in L.A., and as each week progressed there was more and more people, so within the band, those were pretty big milestones for us. We were like “Wow, there’s not only people paying attention, but the right people, and we’re doing things that we were setting out to do. It seemed like we were getting the right attention for the music that we were making. 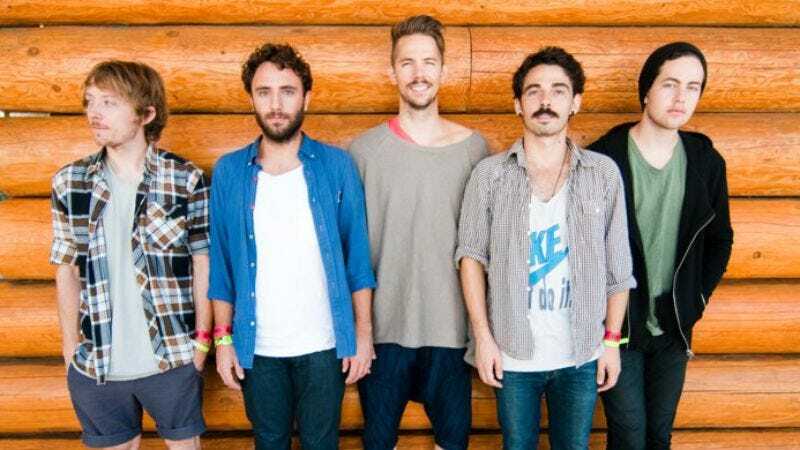 AVC: A major part of the Local Natives sound are those thick vocal harmonies. Is that something you have to drill in rehearsal? AH: With the singing, nobody in the band was classically trained—it’s not like there was one guy who used to be in a barbershop quartet or was a choirboy growing up. I think any time you have a band where there’s more than one person who can sing the lead, harmonies are going to happen. It’s just a matter of everybody sitting around a guitar or piano and playing around with different harmonies and everybody looks around and says, “Oh, that sounded really cool. Maybe we can tweak it here or there.” Very much trial-and-error at this point. AVC: Is that how you approach your bass parts as well? AH: Within the band, nobody has one specific role. It’s not that Ryan is only in charge of doing the guitar parts for the songs or Kelcey [Ayer] is only in charge of doing the piano parts. It’s very much a group effort. Somebody might have the skeleton of a song that they’re working on, and they bring it to the group and then we all jam it out and feel it out and Ryan will say, “Oh, I’ve got this idea for a bassline in my head,” and he’ll try to work it out on the guitar and then I’ll try that. And then I’ll say, “Well, I have this idea for a guitar line that’s in my head,” and he’ll feel out that. It’s a lot of time in the studio or just playing a part over and over. Trying six different melodies over a progression until everybody looks around and nods and agrees. And then we move on to the next part. AVC: What was the discussion like when you were considering your cover of Talking Heads’ “Warning Sign” for inclusion on Gorilla Manor? AH: The cover stemmed from back when we were living in Orange County and we were trying to play a live set and we wanted a cover song in the set to fill it out. I was diving into Talking Heads and researching them, and I think the band as a whole was starting to get into what Talking Heads did past the songs that we would hear in passing. We all loved the band—which is hard for us, to find one band that everybody in the group really likes. And then I heard “Warning Sign,” and I saw potential to cover it, but not just to do a bastardized version of the original—to try to do something that respects the song, but at the same time gave it a Local Natives touch. And when it came time to do the record, there were people around us that we trusted and they were all pushing to get it on the record—there was never any intention of putting a cover song on the record. It was a last-minute decision, and now looking back, everybody’s really happy that we did, because it’s become a staple of the record and more so of the live set. AVC: Playing the song live, do you notice a spark of recognition in the crowd as the song unwinds? AVC: You created the cover for Gorilla Manor, which depicts the heads of all five band members exploding. Were you trying to convey that Local Natives has too many ideas for one band to contain? AH: Somewhat—you’re the first person that’s come somewhat close to putting that together. If there was a concept behind the record, I think the underlying theme is the five us all in the kitchen together, throwing in different things, and with that comes a lot of patience and a lot of time. And there were a lot of stressful situations in trying to do this record all on our own and learning as a band what it takes. It was that balance of trying to really enjoy it and have fun with, but at the same time everybody was so serious and passionate about geting these songs exactly how we wanted them. So that conjured up images of heads exploding, but when they did explode, it was a very colorful and very beautiful thing. That juxtaposition is pretty much the idea behind the name Gorilla Manor. It’s this manor where things are trying to be held up as very serious and very prestigious, but at the same time it's really just five friends knocking around these songs together.